a toy for generating “word clouds” from text that you provide. The clouds give greater prominence to words that appear more frequently in the source text. You can tweak your clouds with different fonts, layouts, and color schemes. The images you create with Wordle are yours to use however you like. You can print them out, or save them to the Wordle gallery to share with your friends. 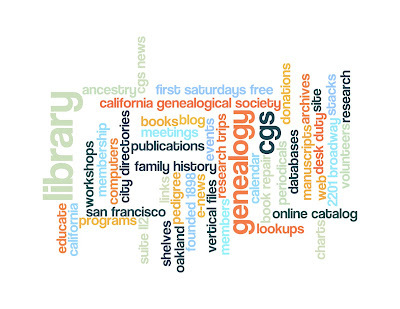 Genea-bloggers have been complaining that they aren't getting any work done and showing off their wordle creations. Wordling - definition: wasting time in a wordleful way. Thanks, fM. Wordleful of you to mention it!